The Virtual Classroom Drop-down menu items in the allow you to access multiple personal settings which let you optimise your experience in the room according to your needs. 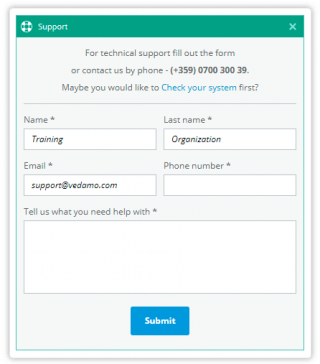 Participants can share their entire screen or a specific desktop application. This functionality is only available for the Google Chrome browser after a specific browser extension is downloaded and installed. In order to make use of the screen sharing functionality, click on your name in the top right corner, which will open the Personal Controls drop-down menu. Every participant can control whether their camera and microphone are “on” or “off” through the “Devices” option in the drop-down menu. More information about controlling participants’ devices and permissions (as a tutor) can be found here. This menu allows you to start or stop your microphone. From your Personal Virtual classroom drop-down menu, under Devices. This menu allows you to start or stop your microphone. From your Personal Settings drop-down menu, under Devices, use the turn off/on camera button. The following functionality clears the cache of your browser, immediately relaunching the virtual classroom. Its use is recommended when user quality experience is compromised. Issues are resolved once the Participant is logged into the room once more. Whiteboard content is not lost. NOTE: The system doesn’t ask for confirmation once you’ve clicked on the button. Participants can change their language from inside the room. 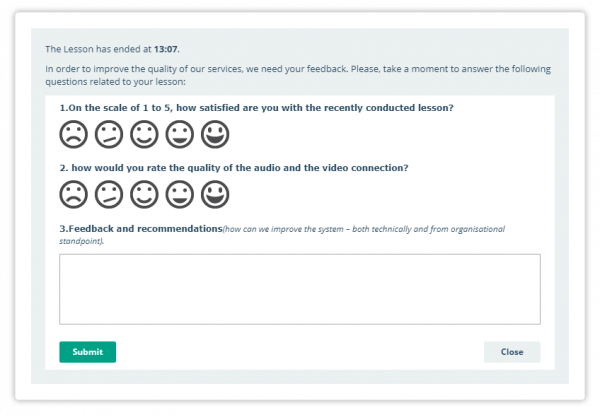 This is only effective for that particular participant, meaning that changing the language on the tutor side will not do so for the rest of the participants in the virtual classroom. Note: If you change the language, the room will be reloaded automatically and you will have to undergo the system check once more. Opens an online version of the Vedamo user guide. This functionality locks the room from the inside, forbidding any future attempts to log in. If a lesson has been underway for 5 minutes with one or more students still running late, a teacher can lock their room to prevent any interruption and distraction for the students that are already in and working. If the late students make an attempt to log in at a later stage, a message will be displayed, explaining the teacher has locked the room and they are no longer allowed access. You will receive a message prompting you to confirm that would really want to Lock the room. Press ‘Yes’ to confirm or ‘No’ to decline the change. 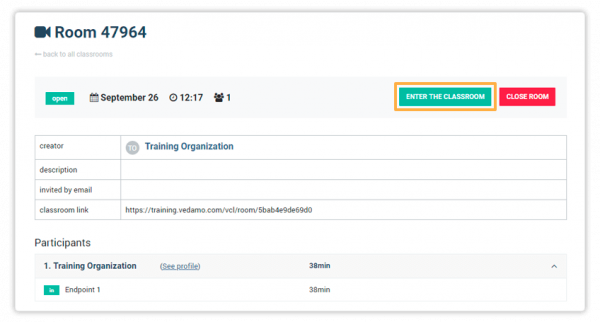 Another functionality from the Virtual Classroom drop-down menu is the Simple View. It allows the participants to simplify their whiteboard and hide away the features and boxes on the left side of their screen. A participant can log out of the room. As long as the room is still open, they can log in once more by reloading the page or through the link they received through their e-mail. 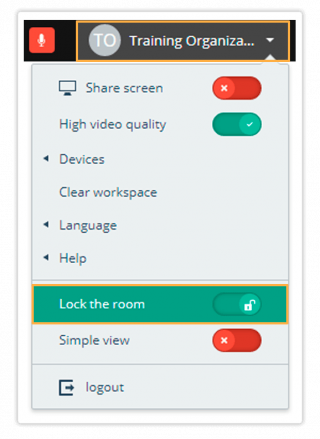 A teacher can log into the room from the ENTER THE CLASSROOM button in the Video rooms section of their Dashboard on Vedamo. NOTE: The system will ask for confirmation. 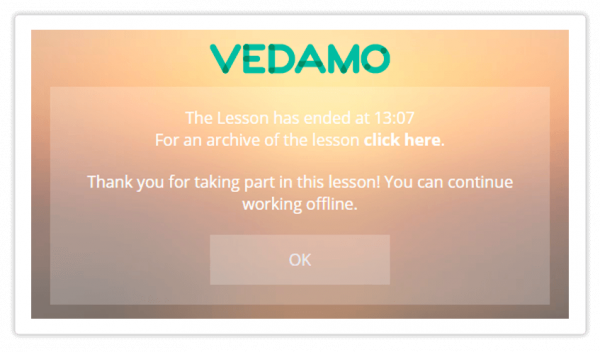 Afterwards they are greeted by a screen letting them know the end time of the lesson and are provided the option of working in the room offline should they wish to. Staying in the room offline will mean they can still view the whiteboard, but won’t be able to interact with it in any way.